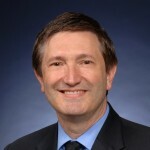 Mr. Geoff Mulligan is a consultant, developer and lecturer on the IoT, Privacy and Security and is the US representative to the ISO Smart and Sustainable Cities project and is Chairman of the LoRa Alliance and Executive Director and founder of the IPSO Alliance. In 2013 and 2014 while serving as a Presidential Innovation Fellow working on the Cyber-Physical Systems project for the White House with the National Institute of Standards and Technology (NIST) he co-created the SmartAmerica Challenge. Mr. Mulligan is the Founder and President of Proto6, a technology consulting company focused on the Internet of Things, RF Sensors, IPv6, IP networks and open systems. He is notable for developing the Embedded Internet and creating the 6LoWPAN protocol and was a founder of the Zigbee Alliance. He helped build the first commercial firewall product and was instrumental in the design of the IPv6 protocol. Geoff holds over 15 patents in network security and electronic mail and is often called to serve as an expert witness on patent litigation. He has testified before Congress on Electronic Commerce and Computer Security and authored the security book “Removing the Spam” in 1999. Mr. Mulligan received his MS in Computer Science from the University of Denver after graduating from the United States Air Force Academy.